The kids thought they were ninjas! This week we have family and friends visiting us from China and Yemen. We wanted to give them, and us, a Japanese experience so we stayed last night at a traditional ryokan hotel in nearby Kyoto. You sleep on tatami mats, wear robes, use the public bath and eat Japanese cuisine. It was one of the most memorable nights I’ve had, and I highly recommend this different experience for everyone. 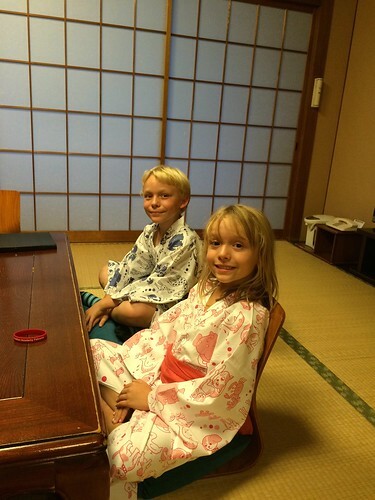 It is a bit expensive, but worth it as a special treat or if you really want to experience old Japanese life. The robes were hilarious and we were asked to change immediately by hotel staff. 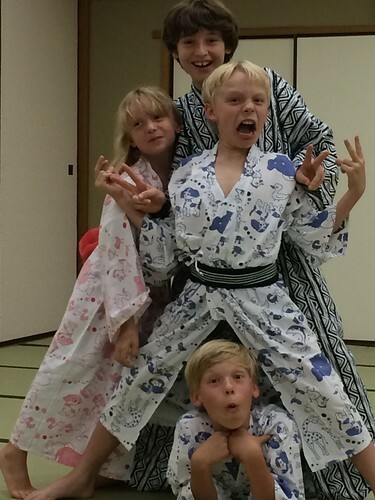 The kids thought they were ninjas or geishas and it was a bit like halloween. The bath was another interesting experience. Japanese bathe naked publicly, something that does not happen in the USA. They are segregated between males and females. The boys wore their trunks because they were shy, but Jim and I went as the locals did. The bath had the squatting shower, three temperature pools, a sauna, and facilities for shaving, etc. It was really relaxing and reminded me of the European spas. The meal was traditional, with the tables near the floor and diners on the pillows. There were multiple courses and many of the dishes, we didn’t know what they were. At night we went for a walk in the old streets of Kyoto and saw the big temple nearby all lit up. When we came back to the room, the futon mats were laid out for us. The staff was superbly friendly and at our service, despite the language barrier. There are many different kinds of ryokans and we will definitely stay again. We stayed at the Hotel Riozen, which was a mid-level price range in a great location. A big thank you to Masago Sensei for the recommendation and to Jim for arranging the transport! Domo arigato!